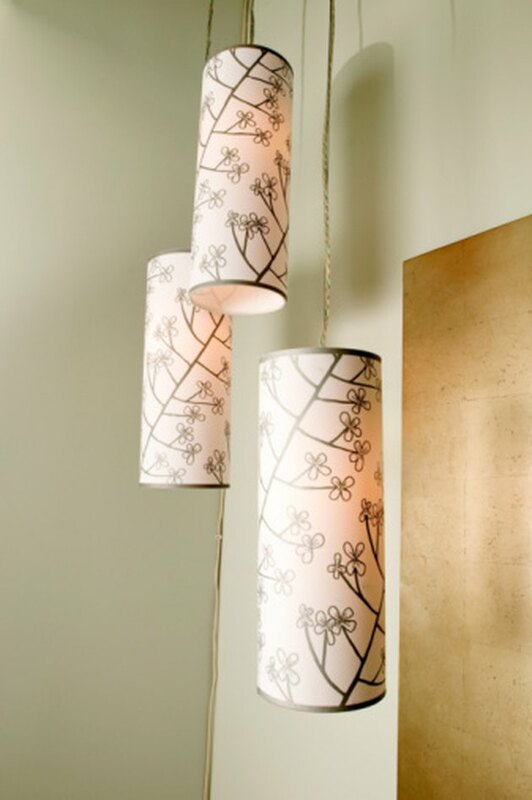 Paper is perhaps the easiest material to apply to a lampshade frame to create a finished lampshade. You can purchase handmade paper at most art stores that is large enough to fit a lampshade. These can create unusual and very organic shades that look quite expensive when they are actually made of paper. Paper can also be punched, pierced and carved into intricate patterns and shapes before being applied to the frame. The limit to what you can create is only your imagination. Round paper lampshades with ribbon trim at the top and bottom edges. Place kraft paper on the table. For rounded shades, position the bottom edge of the frame 1-inch away from the bottom corner of the paper. Turn the frame to start on a rib. Move the frame 1-inch away from the side of the paper. Turn the frame evenly and use a marker to trace a line 1-inch away from the top and bottom of the frame. For most round and angled shades, you will end up with a C-shape. Place paper against flat sided frames and trace around the frame. Add 1-inch to all sides when cutting out the paper. Pre-fit your kraft paper to the lampshade so the paper fits and that you have extra paper to wrap over the wires. Place your kraft paper template over the paper you want to use on the lampshade. Cut out your lampshade paper. For flat-sided lamps, you may have four or more pieces. Place the lampshade on its side. Apply hot glue to the outside of a vertical rib. Center the height of the paper so that there are even amounts of paper above and below the top and bottom of the shade. Apply hot glue along the outside edge of the top and bottom frame and press the paper into the glue. Attach bulldog clips every 2-inches along the frame edges to hold the paper and glue together. When you reach the last section of the lamp, pre-fit the paper and trim your paper side edge so that it overlaps your beginning edge by 1/4 to 1/2-inch. Apply hot glue to the outside of the top and bottom frame and along the underside of your remaining edge of paper. Use your bull clamps to hold the paper and glue together. Allow the glue to dry for 4-hours before removing the clamps. Glue every other panel to flat-sided frames. Trim the paper along the ribs so that it just covers the glued rib. Allow the paper at the top and bottom to be 1/2-inch beyond the frame. After the glue has dried, add the remaining panels and overlap the paper slightly at the ribs. Trim the paper around the top and bottom edge to 1/2-inch of extra paper for round and flat type frames. Notch with scissors where the paper will fit around the lamp frame cross members. Apply hot glue around the inside frame at the top and press your paper into place. Use bulldog clips to hold the paper in place. Repeat with the bottom edge. Allow the glue to dry for 4 hours before using the lamp. Apply ribbon or trim along the exposed seams of flat sided frames. Fold the ribbon over the top and bottom edges when you glue.